The tuition cut threatens the quality of higher education in Ontario and undermines one of the province’s competitive advantages: its excellent places of learning. He overlooked one essential part of the story. 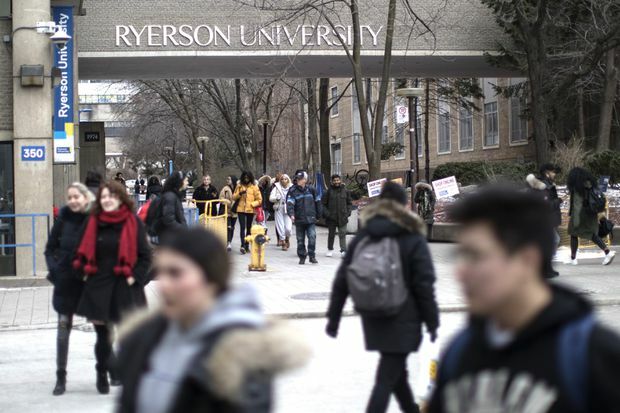 The news about the credit-card expenses came from reporting by The Eyeopener, a Ryerson student newspaper. Student newspapers are often funded by student fees. If students choose not to pay fees to support a campus paper, some might have to stop publishing. The mistakes and misdeeds of student governments would go unexposed. The Eyeopener has been reporting since last year on expenses racked up by the leadership of the Ryerson Students' Union. The paper uncovered credit-card statements that showed thousands of dollars of charges – some at liquor stores and nightclubs. The spending has not been ruled improper – the student-union president told The Eyeopener he was disappointed it had published the credit-card statements without “context or explanation” – but the paper is now reporting that the president and vice-president of operations have been suspended over the affair. The story underlines the importance of the student press. Many of Canada’s best reporters and editors got their start on campus papers. Apart from reporting on everything from the exploits of university sports teams, to the news that classes are to be cancelled due to a winter storm – something that happened Monday at Ryerson – student papers cast the light of scrutiny on both student governments and university administrations, helping hold them to account. Mr. Ford, whose government is taking measures to protect endangered free speech on campus, should understand how much that matters. The affair also showed how far the Ford government has strayed from mainstream conservatism into pocketbook populism. Like its “buck-a-beer” push to promote cheaper beer prices or its move to cut the cost of a tank of gas, the student-fees initiative is designed to show voters that he is saving them money every day. That will seem welcome to many hard-pressed Ontario ratepayers. Anyone who has looked at a university student’s bill recently knows that it includes all sorts of fees and charges on top of regular tuition. Of course, Mr. Ford is planning to reduce that, too: This month he announced a 10-per-cent cut to university and college tuition fees, along with a reform of student loans. But he isn’t giving postsecondary institutions any extra money to make up for the drop in revenue they will experience because of the lower fees. Universities and colleges, says the minister in charge, have many sources of funding – they just need to get creative. Easy to say. In reality, they will have a very hard time making up the difference and maintaining programs for students. The tuition cut threatens the quality of higher education in Ontario and undermines one of the province’s competitive advantages: its excellent places of learning. A real conservative government would free universities to charge what they choose for the education they deliver, not cut their income without offering them extra help. For years, the government’s share of the cost of providing postsecondary education dropped steadily. Tuition fees rose to make up the difference. Mr. Ford is stopping – even reversing – that rise. The tuition cut breaks an important compact with these institutions. It does no favours for students, who may end up facing bigger classes and having fewer resources. It is just the kind of bumper-sticker politics that Ontarians are coming to expect from the Ford government, which already has its eye on the next election.